This recipe has been in my baking list for some time and I finally managed to bake it. The recipe was adapted from Cuisine Paradise with some modification. 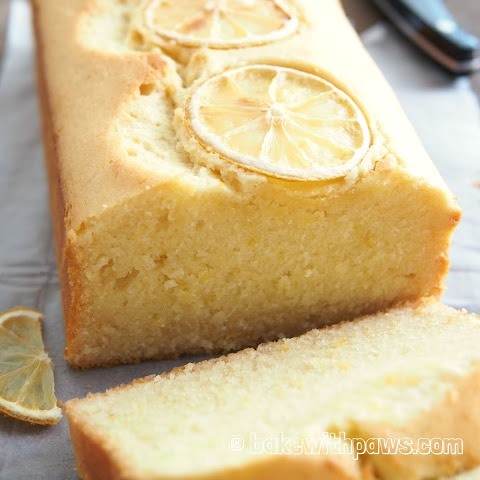 This recipe works and the cake is deliciously moist. I love how the smell of butter fills my kitchen when I am baking this. Using a stand mixer with paddle attachment, cream butter and caster sugar medium-high speed until pale and fluffy (approximately 3 to 4 minutes). Add in the pinch of salt in the middle of beating. Add in eggs, one at a time and beat well after each addition. If necessary scrap mixture off the side of the mixing bowl to make sure all are well beaten. Fold in sifted flour mixture in 3 batches. Next add in lemon zest, juice, salt, yogurt and fold thoroughly till combined. Pour the batter into the prepared loaf tin. 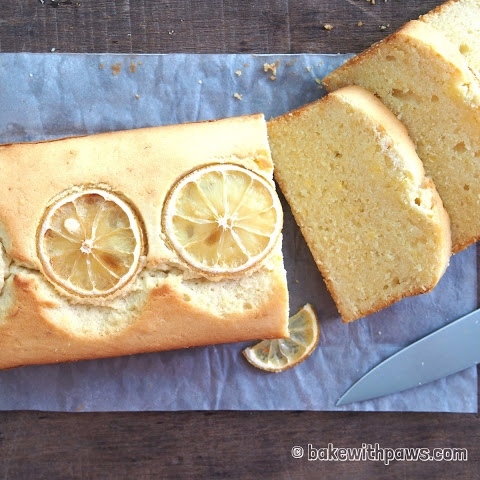 Place few slices of lemon on top as decoration if you wish. Bake at 180C for about 35 to 40 minutes or when skewer insert in the centre and come out clean. Remove cake from the oven and allow to cool in the pan for 10 minutes. Transfer cake to rack and cool completely before cutting it. I used only 1 teaspoon of baking powder and my cake did not rise very high. I should have use 1 ½ teaspoon next baking.